Calum MacLeod's unbeaten 116 helped Scotland earn an eight-wicket win over Ireland in the third and final match of the one-day series in Malahide. With Ireland having an unassailable 2-0 lead in the series, MacLeod's century and 89 from Hamish Gardiner enabled the Scots to clinch a consolation win. John Mooney hit 96 as Ireland reached 241-9 in their 50 overs. But a superb 179-run partnership between MacLeod and Gardiner put the Scots on the road to victory. Gardiner's dismissal left Scotland on 186-2 but Preston Mommsen  stayed with MacLeod during the remainder of the innings as the visitors reached the 242 target with 4.2 overs to spare. 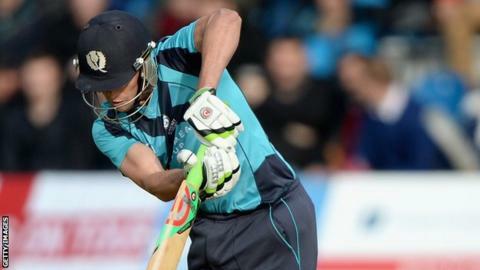 Durham batsman MacLeod struck 15 fours in his unbeaten 116 off 141 balls for his second ODI century as Scotland comfortably chased down their target. Following the early loss of his opening partner Matty Cross for one, MacLeod shared in a match-winning stand of 179 for the second wicket with 23-year-old Gardiner, whose 89 was his maiden ODI fifty. John Mooney was the star of the show for the home side, smashing 96 off 77 balls with 12 fours and two sixes before he was dismissed off the penultimate ball of the innings by Safyaan Sharif. Captain Kevin O'Brien was Ireland's next-best contributor with 36, with off-spinner Majid Haq taking five for 54 for the visitors.